The 2018 FIFA World Cup will be the 21st FIFA World Cup, a quadrennial international football tournament contested by the men's national teams of the member associations of FIFA. It is scheduled to take place in Russia from 14th June to 15th July 2018, after the country was awarded the hosting rights on 2nd December 2010. This will be the first World Cup held in Europe since the 2006 tournament in Germany, the first ever to be held in Eastern Europe and the eleventh time that it has been held in Europe. All stadium venues are in European Russia to keep travel time manageable. It is expected to be the most expensive football championship in history, budgeted at just under £9 billion to £10.5 billion, surpassing the cost of the 2014 FIFA World Cup in Brazil. The final tournament will involve 32 national teams, which include 31 teams determined through qualifying competitions and the automatically qualified host team, Russia. Of the 32 teams, 20 will be making back-to-back appearances following the last tournament in 2014, including defending champions Germany, while Iceland and Panama will both be making their first appearances at a FIFA World Cup. A total of 64 matches will be played in 12 venues located in 11 cities. The final will take place on 15th July at the Luzhniki Stadium in Moscow. Pre-tournament favourites to win the World Cup are Brazil, France, Germany and Spain. Of course, England is my choice to win the World Cup. Come on the Young Lions! So why not ‘Show Your Colours’ for your World Cup team at Postbox Shop? Take a look at our new and exclusive range of personalised letterbox prints! Choose one of these to show your support and Show your Colours. Why not choose the England flag? Or you could have your favourite country’s flag printed on a postbox supplied by Postbox Shop. Or similarly, create your own World Cup artwork…you design it, we’ll print it. 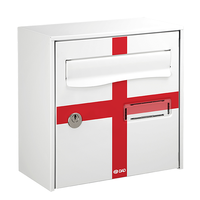 As standard, currently we supply an England letterbox, but perhaps you want your favourite World Cup national flag or image of your hero or heroine, printed and displayed proudly on the front of your letterbox? Anything is possible with our bespoke letterbox designs. Make your letterbox really yours and stand out from the crowd. These bespoke letterbox designs are suitable for large amounts of mail and wall mounting, to suit all requirements. This easy to use letterbox range is manufactured of electro-galvanised steel, UV resistant, scratch resistant and waterproof, keeping your mail dry. What an original and practical way to show your colours, letterboxes don’t have to be boring, they can be eye-catching!